St. Mary’s Orphanage of the Catholic diocese of Peoria, located at Metamora since its establishment about the year 1877 by Archbishop John L. Spalding, was this week transferred to Peoria, to occupy the new building recently built for the purpose at a cost of about $100,000. The furniture and other effects of the institution were shipped the first part of the week over the C. & A., and on Tuesday a dozen automobiles, furnished by citizens of Peoria, came out and conveyed the 55 children and ten sisters of the institution to their new home. The decision to move the orphanage was made more than a year ago by Bishop Dunne, who as head of the diocese has direct charge of the institution. Bad train service and inability to get sufficient water at this point were assigned as reasons in part for the removal as well as the desire to have the institution at the seat of the diocese. Conveniences afforded by the city also made the change desirable. Six years ago Archbishop Spalding, who was then in charge of the diocese, caused part of the original structure to be torn down and a new main building was erected, at a cost of over $20,000. Last year the institution was again confronted with a demand for more space, and upon due consideration it was decided to save this expense and purchase a site in Peoria. This was done and the local property has since been on the market for sale. The buildings and grounds are probably worth $50,000 and there is a farm of 200 acres adjoining, which is also offered for sale. Offers have been received, it is said, but none has been accepted. The farm and buildings will be sold separately and among those who have their eye on the former is said to be the Order of Franciscan Fathers of the Cincinnati province. There is also a probability that the diocese industrial school may be established here at some time in the future if the diocese retains the property. 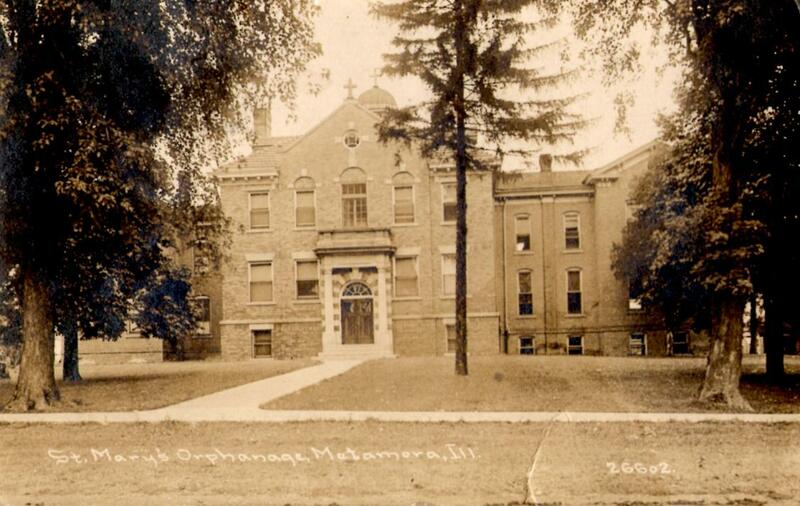 The orphanage property was purchased in 1915 by the Metamora School Board and became a four year high school. A three-month old infant died at the Orphange Monday. The child was a little girl and was brought here about six weeks ago from St. Francis Hospital, Peoria, where it had been born, the mother dying soon after. The child was not expected to live when brought here, being very sickly. For a time it seemed to improve, but for the last week it was gradually dying and nothing could be done for it.